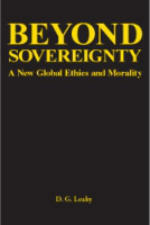 Title: Beyond Sovereignty: A New Global Ethics and Morality Author: D.G. Leahy Imprint: The Davies Grouop, Publishers soft cover 386 pp. USD 32.00 ISBN 978-1934542194 August 2010 In the context of a careful critique of the relevant thinking of Badiou and Agamben, the writer articulates an understanding of ethics and morality alternative to the otherwise highly creative extensions of modern consciousness embodied in the works of these authors. Opting for direct quotation rather than paraphrase, he shows in fine detail the limits of these most recent forms of self-referential thinking, contrasting them at every step with what he calls “the thinking now occurring for the first time.” The exposition of the new ethics, developed in contrast to Badiou’s “ethic of truths,” is accompanied by a table summarizing its logical structure in the form of an “Index of the Ethic of Simplicity,” which contains, among other things, pointers, historical and otherwise, to other domains of thought. Likewise, prior to its intricate ontological exposition, the “Morality of the New Beginning” is first laid out in the form of a table containing an Ennealogue of the moral imperatives for the new world reality, at once synoptically related to commandments of the Old Testament and the precepts of Jesus. Contents Preface I Incarnation: Essential Conception of Existing The Global Imperative to Begin to Exist II Omnipotence Nimble: The Ethic of Simplicity 1 The Question of Ethics 2 Ethic of Simplicity 3 Good and Evil III Beginning Now: The Creating Society 1 Beyond Beyond X 2 Creating Society 3 Morality of the New Beginning Appendices 1 The Person as Absolute Particular 2 Categories and Relations of Persons 3 Whether Evil Creates the New World 4 The Scriptural Understanding: Omnipotence Ceasing Completely Works Absolutely Backnotes 1 Note to Faith and Philosophy Further to the Ontology of Real Trinary Logic 2 Beyond the Good: Not Hither the Good (& Not Hither Beyond the Good) 3 The Real Beyond the Void: the Beginning/the Power Body 4 The Simplicity & Syntax of the Concepts, Immediacy, Mediation, Omnipotence, & Beginning Index Review “Beyond Sovereignty is a splendid new step in the scintillating trajectory of thought that has been traced out by D. G. Leahy over the past several decades. With a systematic rigor not seen in American philosophy since Peirce, Leahy sets out his vision of the fourfold structure of ethics—a vision at once convincing and original. In so doing, he shows the relevance of his thinking to contemporary figures such as Levinas, Agamben, and Badiou. Altogether an astonishing achievement.” — Edward S. Casey, Distinguished Professor of Philosophy, SUNY, Stony Brook Author David G. Leahy, formerly Distinguished Visiting Professor of Philosophy at Loyola University Maryland, is the author of Novitas Mundi: Perception of the History of Being; Foundation: Matter the Body Itself; and, Faith and Philosophy: The Historical Impact.